Dumbarton have sacked manager Paul Martin as Philip Mills announced that he has withdrawn his takeover bid for the club relegated to Division Three. Mills told the club time had run out on his offer and he had decided to invest elsewhere the £1m he had set aside. Dumbarton said that Martin and chief executive John MacFarlane had "agreed to differ" following discussions. "As consequence of this Board have decided to part company with Paul Martin and John Gallacher," it said. Dumbarton were left in the automatic relegation spot at the foot of Division Two after a late end-of-season rally by Alloa Athletic. Meanwhile, Mills issued a statement to MacFarlane about his attempt to buy a majority shareholding at Dumbarton. The Dubai-based businessman blamed an ongoing problem over existing shareholdings and a missed meeting with the local MP for his withdrawal. "I have discussed the Dumbarton Football Club situation with my partner at length," said Mills. 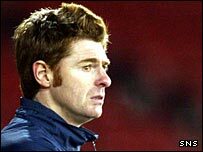 "Taking into consideration that we gave John McFall one month's notice of my trip to Scotland and the fact he was available in Dumbarton for my whole visit, I was extremely disappointed at his refusal to meet me. "I had spent a lot of time and effort preparing a proposal I felt was best for the club. "To be treated like this from our MP was very annoying, especially as we where trying to invest serious money in the area. "Mills Bowley Investments have had over £1m blocked in its account for this investment for some time now. "It is with deep regret and sadness that I have to inform you that we can spend no more time on this acquisition. "We have had to take this decision as a business decision and have decided to utilise these funds to expand our businesses in the Middle East. "Once again, I would like to reiterate my heart felt thanks for your outstanding efforts in trying to conclude this deal. "I would also like to thank the board members and yourself for all the assistance that was given to my father. "My whole family are very disappointed that the deal has fallen through and very saddened that I was not able through certain political aspects to invest in the Dumbarton area for the benefit of the Dumbarton people, especially the younger generation."